I decided to design my own business cards this afternoon. Ah! Ah! Ah! No spoilers! You didn't really think I'd post an uncesored business card on to my website, did you? Besides, I'm a bit timid about making all my contact information public online, so should you, unless you have a business or an office to contact. 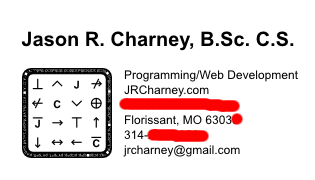 At any rate, I designed these cards using Inkscape, used the logo I degsigned from a while back and put the important stuff that would woo anyone that I would need to impress at a job fair or interview. I wish I could add a small QR Code in the lower right corner that would point to this website for smartphone users, but this looks good for right now. I'm considering taking the SVG version of my file down to Kinko's in the near future. Hopefully my logo will come out in full detail. The border has the logic rules in it. I'm thinking of also developing a stamp and maybe some mailing labels. I just felt I sharing this real quickly. Back to work on those scripts!